The OMEGA Speedmaster was originally conceived for those who needed to rely on precision timekeeping: scientists, engineers, athletes and the like. 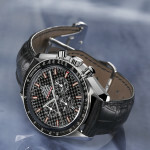 At the time of its launch in 1957, nobody could have predicted that the Speedmaster would also be chosen to keep track of time on the world’s first manned spaceflight missions, notably taking it to the Moon several times and leading to a vital role on the Apollo 13 mission, where it timed the firing of the rockets to help the crew return safely to Earth. More recently, the Speedmaster’s racing links are illustrated by five-time Formula 1 world champion Michael Schumacher, who is both an ambassador for and an avid collector of the Speedmaster. The new Speedmaster Racing offers a contemporary interpretation of the racing theme whilst maintaining the unmistakable and classic look of the Speedmaster. The first-ever advertisement for the OMEGA Speedmaster in 1958 presented the new chronograph as a watch “for men who reckon time in seconds”. The picture accompanying the advertisement showed a co-driver timing the speed of a car over a test mile. In a time before computers, the Speedmaster was the perfect instrument for calculating the exact speed of a vehicle or the hourly output of a machine, which could be read off at a glance using the tachometer scale on the watch’s bezel. The tachometer scale, etched into the black aluminium ring on the brushed steel bezel, remains to this day the unmistakable characteristic of an OMEGA Speedmaster. 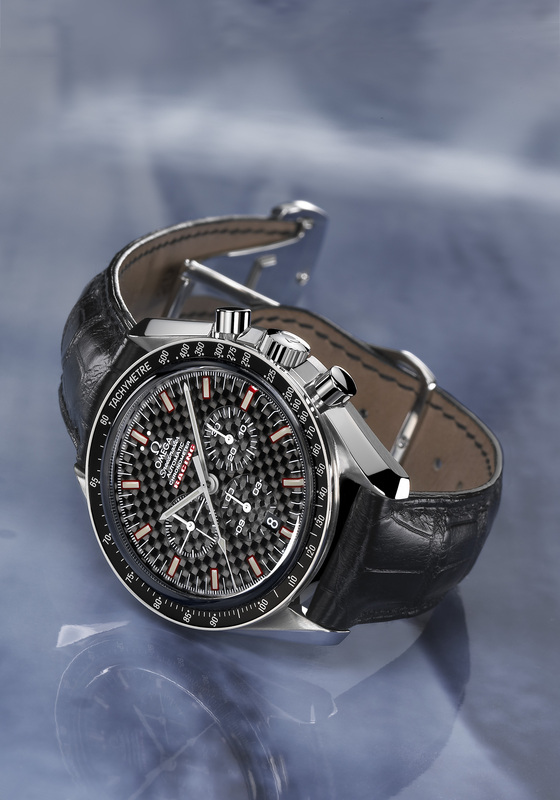 The Speedmaster Racing marries this classic Speedmaster look with a modern interpretation of the dial, in which the traditional matt black colour is replaced by black carbon fibre, a high-tech material used in Formula 1 construction. The sporty look of the dial is completed by luminous hour markers in Super Luminova with red outlining and the “RACING” inscription on the dial in white letters with a red outline. The exclusive OMEGA calibre 3301 used in the Speedmaster Racing fulfils the original remit for the Speedmaster to be a robust and reliable chronograph – a claim that remains true today. The self-winding chronograph movement has a power reserve of 55 hours and is also an officially certified chronometer. It is fitted with a vertical coupling, which means that there is no delay in the chronograph hand when the chronograph is started, and a column wheel, which ensures precision start, stop and reset functions for the chronograph hand and totalisers. This superlative chronograph (only few watch manufacturers have mastered the sophisticated techniques required to produce column-wheel mechanisms) is perfectly complemented by the OMEGA free sprung-balance without index, which ensures that the regulating power of this timepiece remains excellent over the long term. A screw-in case back (with RACING inscription in red) and OMEGA double gasket crown ensure that the stainless steel case is water resistant to 100 metres and a scratch-resistant, anti-reflective sapphire crystal protects the unique look of the dial. The Speedmaster Racing is available with a stainless steel bracelet with RACING inscription on the safety clasp or a black alligator leather strap with a stainless steel foldover clasp. It is the perfect timepiece for anyone looking for a chronograph of distinction with an unmistakably sporty edge. This entry was posted in Press Release, Speedmaster Automatic and tagged 3552.59.00, Racing on April 4, 2003 by Dale Vito.